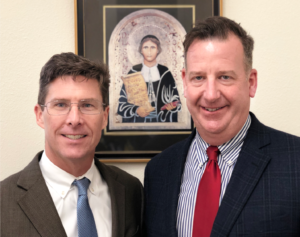 President Mike Anderer recently informed us of his decision to step aside as Founding President of Cristo Rey De La Salle, effective immediately. While we will miss Mr. Anderer, we respect his decision and express our full support. Among his many contributions to our school community, Mr. Anderer leaves behind a strong legacy and culture of community along with a rich commitment to inclusive diversity and equity. His dedication to our mission has inspired many, and we are grateful that he will be supporting Interim President Mr. Matt Powell to ensure a smooth leadership transition at this time. Thank you and God Bless you, Mr. Anderer! I invite you to read Mr. Anderer’s letter to our community here. We welcome Mr. Powell to our Mustang family with open hearts. Mr. Powell has led two other Cristo Rey Schools in Portland and in Tucson, and we thank Mr. Powell for taking a leave from his current role with the Christian Brothers in Napa to serve our community. You can learn more about Mr. Powell by reading his introduction by the Board of Trustees here. The Board of Trustees will begin a search for the new Permanent President immediately. As always, we thank you for your dedication to our Cristo Rey De La Salle mission, and we look forward to continuing to partner with you to build upon Cristo Rey De La Salle’s unique personalized learning program, strong corporate partnerships, and inclusive community to advance the school to its next stage of success.